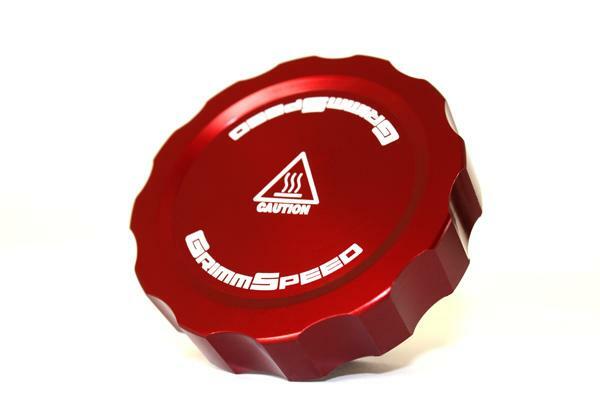 GrimmSpeed Billet Aluminum Oil Cap - Dezod Motorsports Inc - Home of the automotive performance enthusiast since 2002. Kick out your old oil cap and tell it to hit the streets, we have a younger, much more attractive version to shine up that engine bay! The GrimmSpeed Oil Cap fits like OEM and allows room for intercooler piping or any hoses/cables. We also added a little caution in there for when things get HOT! Achieving good looks, really really ridiculously good looks, it’s what you can expect from GrimmSpeed. Caution HOT! symbol on cap.